Hangings, lynchings and jail breaks are long forgotten in Pacific County, where tourists flock to quaint attractions every season. But back in the early days, when the first jailhouse was built, this was a rough, rustic setting. Popular cannery worker Lum You was hanged here in 1902—the only legal execution in county history. Industrious smugglers and creative entrepreneurs outwitted state-sanctioned prohibition measures, though some still did time in the jailhouse. Historian Sydney Stevens presents a collection of tales culled from a forgotten prison record book. Opium fiends, thieves, military deserters and even wayward girls jailed for incorrigible acts are brought out of the shadows of a wilderness long gone. 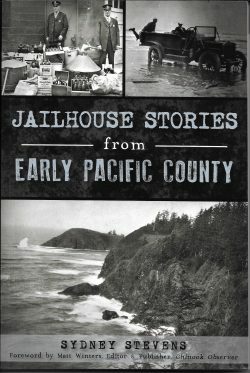 Jailhouse Stories from Early Pacific County retails for $21.99 and is available or can be special ordered at local independent bookstores, at History Press http://historypress.net/ or through Amazon.com by clicking on the appropriate book cover icon below left.